Rivers SOS organised a screening of Gasland at Campbelltown Arts Centre on Sunday afternoon. Our guest speaker was John Hatton who opened with a fiery condemnation of corruption in the approvals process for mining and CSG extraction, adding that both major parties were/would be equally culpable. He described his recent tour of mining operations around Mudgee and the shocking impact on local people and their environment. John Thompson from Broke, of the Lock the Gate Alliance, also spoke passionately of the campaign by farmers to keep gas exploration off their properties, and asked for support for the rally on 20 March (12 noon in Martin Place). Representatives of local groups opposing CSG extraction in this region also spoke: Jacqui Kirkby from the Scenic Hills Association (opposing AGL’s plans in the Varroville area) and Greg Petty from the Otford Defenders (opposing Apex plans in the Darkes Forest/ Woronora Plateau area, including plans for a well inside the Special Area of Sydney’s drinking water catchment). Danica Sajn, Greens candidate for Camden, gave a critical analysis of AGL’s Environmental Impact Statement, while Judy Hannan, Deputy Mayor of Wollondilly and independent candidate for Wollondilly, spoke of the drying up of Thirlmere Lakes, probably due to longwall mining nearby. John Hatton, Greg Petty, Judy Hannan and Danica Sajn are all candidates in the upcoming NSW election and we wished them well. 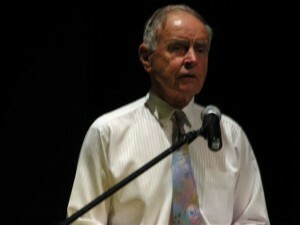 Catherine Cusack (Liberal Shadow Environment Minister) and Phil Costa (ALP, Wollondilly) were also invited but declined. The audience included well-known Picton residents Don and Noline Baker, Noel Lowery of The District Reporter, John and Edwina Macarthur Stanham of Camden Park, Sharyn Culliss from Georges River Environment Action, Pat and Barry Durman of Wedderburn Against Mining and Sister Jennifer Jones from the Carmelite Monastery at Varroville. Rivers SOS will continue our involvement in the CSG issue, now expanding rapidly in the Southern Coalfield. The Gasland DVD showed us how the fracking process contaminates ground water and river systems, and lowers the water table, as well as its health effects on humans and animals. The situation in the USA is similar to ours: no adequate research or information, no adequate legislation or regulation. We join the call for a moratorium and plan to take our Rivers SOS banner to the Sydney rally on 20th March. This entry was posted in Events, News and tagged coal seam gas, fracking, gas land coal seam gas, health impacts, water. Bookmark the permalink.